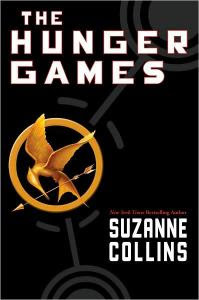 The Hunger Games by Suzanne Collins is a science-fiction book. This book is about a sixteen year old girl named Katniss Everdeen and her sister Prim Everdeen live in District 12. Katniss is the girl who knows how to shoot an arrow so accurately she can shoot an arrow blind. She knows the right herbs to help cure a wound and the best edible plants around. She knows the difference between bad meat and good meat and knows how to pick non-poisonous berries. She is Hunger Game material. Reaping Day is the day where the people of District 12 and all of the other districts get kids 12 and older get picked to go to the annual Hunger Games. The Hunger Games are the games where the object of the game is to be the last one alive while the rest of the contestants are lying dead. When Katniss's sister gets picked to go to the Hunger Games, Katniss volunteers to take her place to save her sister's life. Her partner is non other than Peeta Mellark, the one who gave Katniss food to help her family from starving. Together, these to tributes will work as hard as they can to stay alive. Will they survive or will they fall to the ground dead? I really enjoyed this book. It has a little bit of everything in it. It has compassion, love, action, and many more essential elements that a book needs. The first person who recommended this book to me was actually my librarian at school. She said that if you wanted to stretch your range of genres, you should start with this sci-fi book. I said that I would definitely read it. And when I did, I couldn't put it down. My mom actually had to hide it from me so I could finish my homework. Also, if you have read the Twilight Saga by Stefanie Meyer, you will defiantly love this book. I hope you enjoy this fast paced book!! !